Search results for "studio gang"
Although the office has evolved to be many things with the advent of creative, collaborative spaces, standing desks, and remote working, there is one workplace constant: the task chair. Rolling to-and-fro at a desk nearby, these six chairs on casters are designed for comfort and durability. Diffrient Smart Chair Humanscale "So striking in mesh," says almost no one. 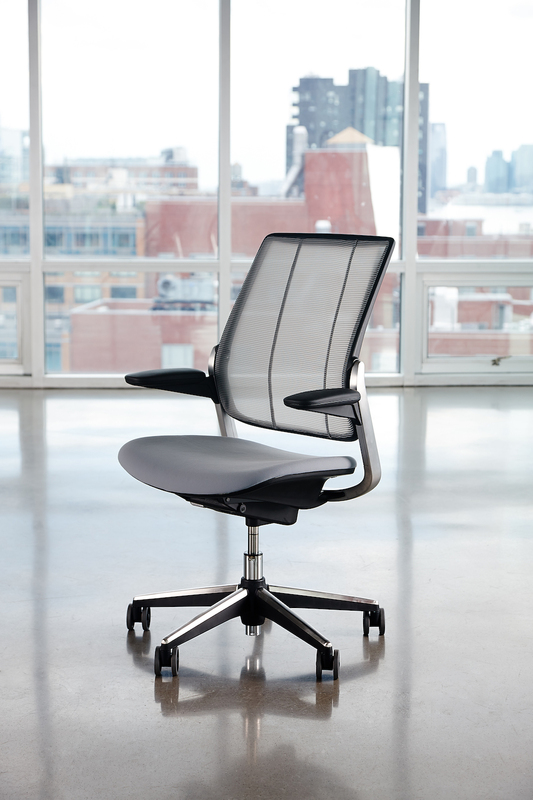 This chair is the exception, featuring a tri-panel, u-shaped mesh backing that encourages ergonomic postures. Nuova Contessa Teknion This chair was designed to encourage sitters to move and change positions to optimize their workflow. To fall in line with the office aesthetic, it is offered as an all-mesh model or with mesh back and upholstered seat in a spectrum of workplace-ready hues. Elephant with casters Kristalia Like the the largest land mammals that inspired its form, this chair is sturdy with a stiff polyurethane structure, yet soft to the touch. It is available in upholstered fabrics by Kvadrat, or in hide with visible stitching that emulates an elephant’s backside. BuzziBounce BuzziSpace Rock n’ roll! Shaped like the letter S, BuzziBounce’s tubular steel frame offers a spring-like “bounce” when sitting. Bringing movement to an otherwise static workday, the effect also provides the appearance and feeling of weightlessness, in a full range of bright and pared-down colorways. X3 X-Chair Tired from sitting? This chair tends to all those problem areas with an adjustable backrest height, a dynamic lumbar support, and an independently adjustable head and neck rest. 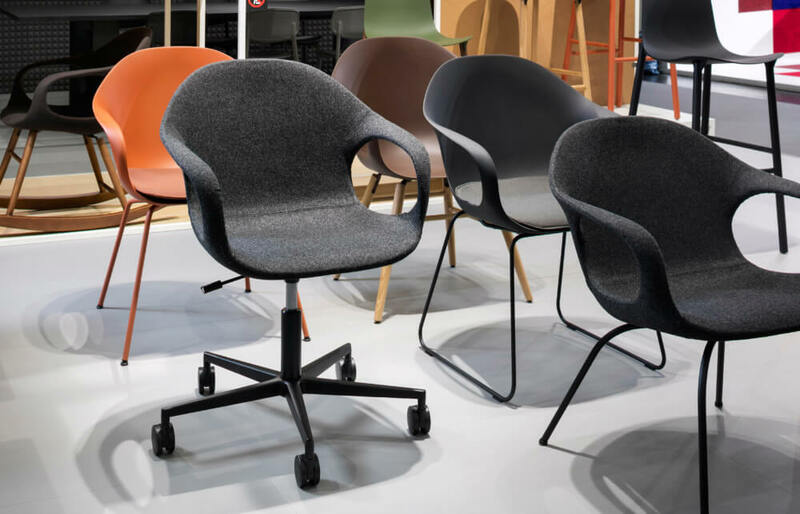 Notably, the chair supports the user’s weight with Advanced Tensile Recovery fabric, a multilayered knot polymer whose support system was inspired by flying buttresses. Lyric Allsteel Wolfgang Deisig, founder of the Berlin-based studio Deisig Design, designed this task chair to fit in with other office furniture, yet stand out with brilliant pops of color. It is offered as a mid-back or high-back chair, in standard or large-and-tall sizes. The Designing Material Innovation exhibition—co-presented by the California College of the Arts (CCA) and the University of Michigan Taubman College of Architecture and Urban Planning at the CCA campus in San Francisco—aims to utilize contemporary architectural research in an effort to envision potential futures for the school’s backlot. The exhibition consists of five experimental architectural pavilions built to test new conceptual approaches in the realms of materiality, fabrication, and design. The pavilions, crafted with industry and academic partners, also attempt to articulate new ways of working outdoors in an effort to help guide designs for a forthcoming campus expansion by Studio Gang. Designs for the expansion are still in the works, but the scheme is expected to rely on a network of socially-driven outdoor workspaces and venues—Designing Material Innovation will act as a pop-up of sorts, testing the limits of what is possible outdoors at the CCA. The exhibition was curated by Jonathan Massey—the current dean at Taubman College and recent dean of architecture at CCA—who brought together APTUM Architecture, MATSYS, the CCA Digital Craft Lab, T+E+A+M, and Matter Design for the show. 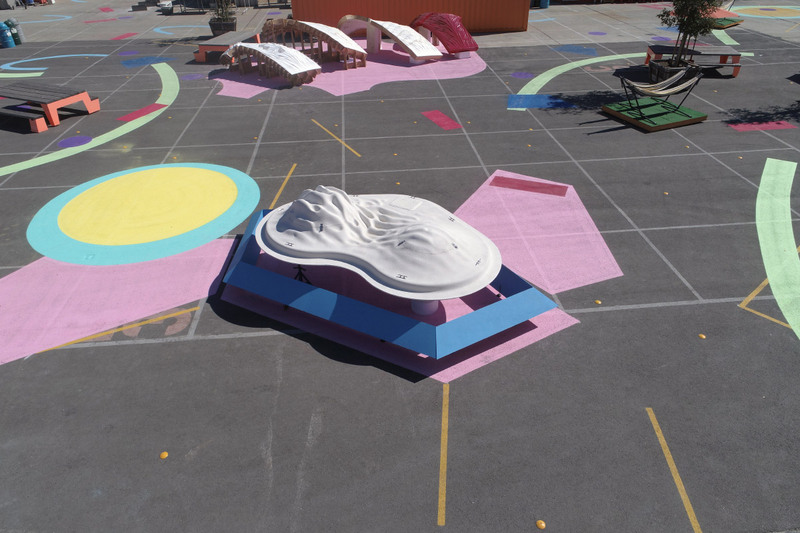 Exhibition design for the showcase came from Oakland, California–based Endemic Architecture, who created a “confetti urbanism” installation for the site that whimsically reworks existing furnishings into a playscape that hosts the experimental pavilions, as well as give students a place to fabricate their projects. “Designing Material Innovation shows how designers and industry leaders partner to achieve great things, whether that is making concrete structures light and delicate, promoting ecological diversity, or repurposing waste,” Massey said. APTUM Architecture collaborated with Mexican building materials company CEMEX to devise new methods of testing fiber-reinforced methods to pursue extremely thin concrete shell structures. The ten-foot-by-ten-foot pavilion is made of interlocking concrete arches that are only one-third of an inch thick. A second vaulted pavilion was made by Oakland-based MATSYS with help from the CCA Digital Craft Lab. The complexly curved shell structure was robotically milled from foam waste and is coated in synthetic resin. The Buoyant Ecologies Float Lab by the CCA Digital Craft Lab and Kreysler & Associates comprises a “floating composite shell structure” according to the exhibition website, and was fabricated using fiber-reinforced polymers. T+E+A+M and University of Michigan came together to generate a “new architectural order” made from “plasticglomerate,” an amalgamation of rocks and plastic waste cast into a grouped cluster of columns. The final team—Matter Design and Massachusetts Institute of Technology—fabricated a 16-foot-tall, 2,000-pound glass fiber reinforced concrete sculpture that pivots and moves freely despite its hefty appearance. Taken together, the installations offer not just a glimpse into the future of material experimentation, but pique interest in Studio Gang’s forthcoming additions, as well. It has been 40 years since Learning from Las Vegas introduced the world to the idea of the architectural duck. Though often held up as everything that is wrong with postmodernism, ducks seem to have some real lasting power. Every year, a number of projects take the idea of the duck a few steps further. 2017 has been no exception. Here are some of this year’s most notable ducks. LEGO House – Bjarke Ingels Group (BIG) Billund, Denmark There may be no toy in existence which has had a bigger impact on the minds of future architects than Legos. 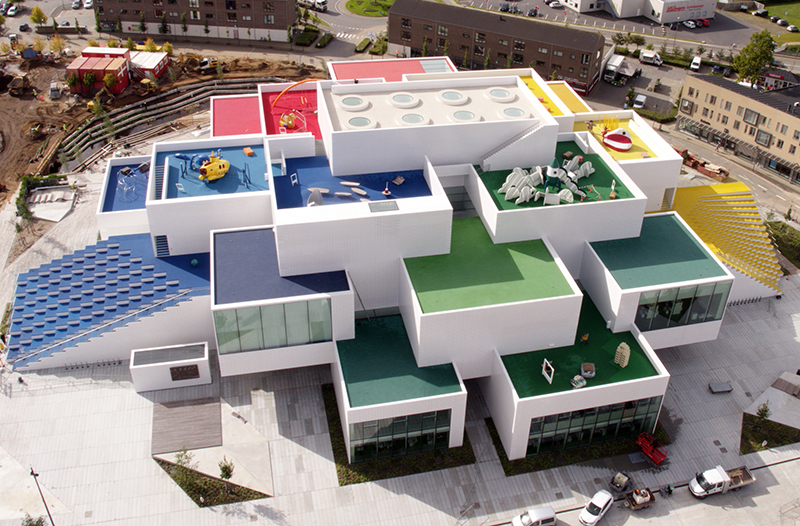 Located in Billund, Denmark, BIG’s LEGO House takes the idea of a duck to an extreme. The LEGO House’s is comprised of 21 LEGO-shaped volumes, with round skylights on the top level resembling the iconic two-by-four LEGO block. The project was conceived as an interactive attraction for the Billund’s Downtown, where LEGO is headquartered. Apple Flagship Store – Foster + Partners Chicago, Illinois Over the past decade and a half, Apple has been constructing flagship stores around the world by designers such as Bohlin Cywinski Jackson and Norman Foster. Their latest seems to take the company’s branding very seriously. The new Foster-designed Chicago flagship takes the undeniable form of an Apple laptop. Early rumors predicted the ultra-thin long-span carbon fiber roof would be adorned with the iconic apple symbol. While that rumor never proved to be true, the grey roof from above still resembles a giant Macbook Pro. "Domestikator" – Atelier Van Lieshout Paris, France Though originally created in 2015, "Domestikator" by Atelier Van Lieshout made its way back into the headlines when the Louvre refused to display the building-size artwork this year. The Louvre’s art director, Jean-Luc Martinez, stated that the fear of “being misunderstood by visitors” was the reason for the reversal in plans to show the work during the FIAC International Contemporary Art Fair in the Tuileries Gardens. Atelier Van Lieshout’s founder, Joep Van Lieshout, had planned to live in the structure through the duration of the festival. Seminole Hard Rock Hotel & Casino Hollywood, Florida Still under construction, the Seminole Hard Rock Hotel & Casino is a $1.5-billion entertainment development that takes the shape of a immense electric guitar body. At 450 feet tall, the hotel will include 600 rooms, multiple restaurants, and a 41,000-square-foot spa. While the shape of the hotel does not include the neck or head of the guitar, a series of six vertical fins resembling guitar strings run up the front of the building. Rather than a typical groundbreaking, the project had a “guitar smashing ceremony,” and is expected to be complete in 2019. Richard Gilder Center for Science, Education, and Innovation, American Museum of Natural History - Studio Gang Architects Washington, D.C. Studio Gang is no stranger to biomorphic forms in its designs. The new addition and renovation to the American Museum of Natural History, currently still in the design phases, takes this interest a few steps further. While the exterior resembles a weathered rock face, the interior takes on the form of a full-out natural cave. Though formally resembling a subterranean cavern, vast expanses of glass bring bright natural light into the space. The 235,000-square-foot Gilder Center is expected to open in 2020. The Kent State Center for Architecture and Environmental Design is a beacon for the university’s creative research-based programs. A continuous gallery anchors the building’s main public level and opens to a new pathway between the university and recently revitalized downtown Kent. The ascending sequence of ground-floor spaces includes a cafe, a gallery, a 200-seat multipurpose lecture room, a library, classrooms, and reading areas. An expansive 650-seat design studio forms the heart of the program. 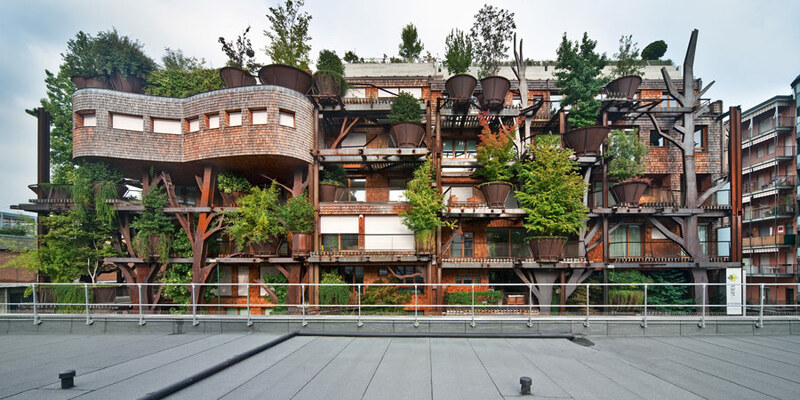 The tiered arrangement of studios informs the massing of the building, which bridges the institutional and residential scales of its neighbors. Stairways activate the north and south facades, and glazing along the north facade brings light into the studios and provides panoramic views. 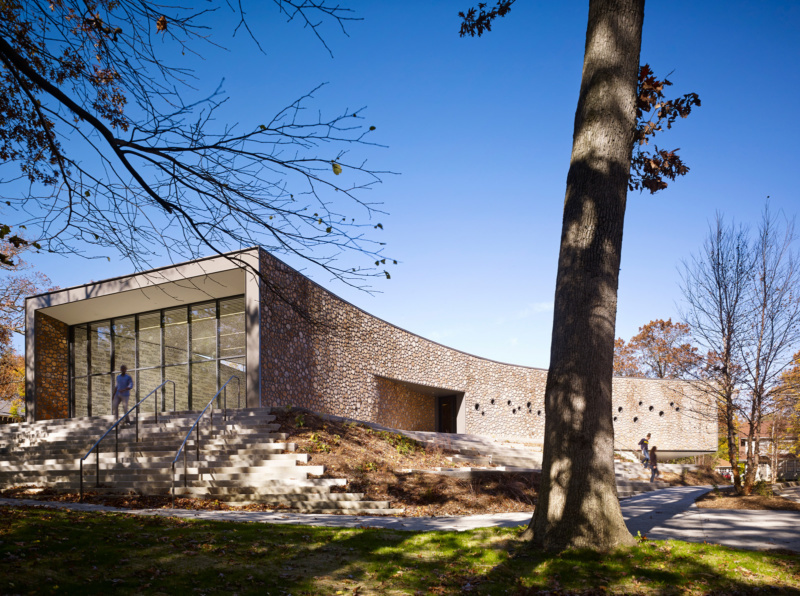 The color and texture of the iron-spot brick facade and custom brick fins, fired locally in a beehive kiln, adopt the vernacular of the surrounding campus and city. Featuring a mix of student residences, dining amenities, classrooms, retail, and green spaces, the Campus North Residential Commons is designed as a welcoming new portal to the University of Chicago. 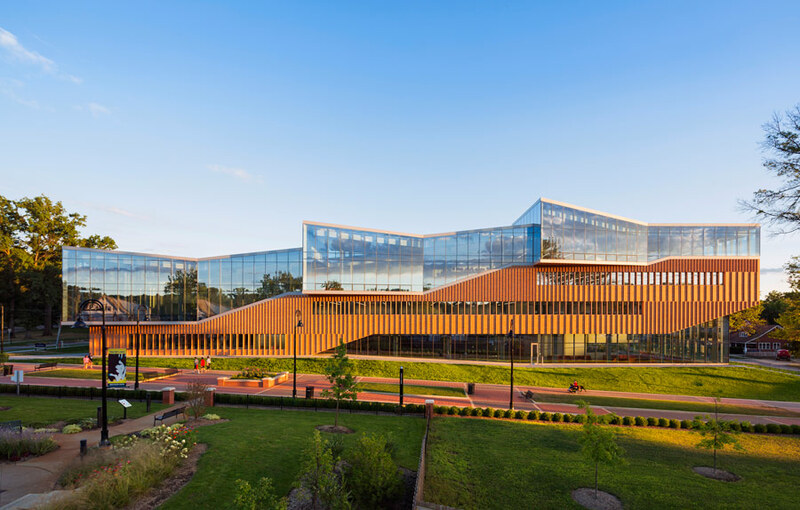 The design situates three bar buildings in an urban fabric of inviting outdoor spaces, defining a new quadrangle in a previously ill-defined area of campus. The buildings are scaled to their context: The tallest structure fronts a busy thoroughfare; the shortest structure is attuned to the neighborhood. The precast concrete facades reinterpret the campus’s traditional neo-Gothic limestone buildings. Supporting the University’s House system, which forms communities of students from different years to bolster social and academic success, the buildings are organized around three-story “House hubs,” cozy, home-like spaces where undergraduates can gather. Altogether, the project enriches the academic experience by encouraging exchange among students and strengthening their ties to the surrounding community. Paris is not known for skyscrapers. Its largest, the plodding, 690-foot Tour Montparnasse, is also acknowledged as the ugliest building in the metropolis. (Buildings in Paris itself were banned from rising above seven stories two years after Montparnasse was constructed.) And its largest concentration of towers, the La Defense district just west of the city limits, has not produced a critical mass of towers since it was created decades ago. But if plans hold, this is about to change significantly, as French officials and business owners have announced plans to overhaul both Montparnasse and La Defense, while the city's largest tower since Montparnasse, Herzog & De Meuron’s Tour Triangle, continues to move ahead. The owners of Tour Montparnasse, Ensemble Immobilier Tour Maine-Montparnasse, last month commissioned French consortium Nouvelle AOM to reclad and renovate the Tour Montparnasse as part of a $350 million modernization. The firm defeated an illustrious shortlist of international competitors that included Studio Gang (the runner up), OMA, MAD and Dominique Perrault Architecture. Nouvelle AOM consists of French architects Franklin Azzi, Fréderic Chartier, Pascale Dalix, Mathurin Hardel and Cyrille Le Bihan. Their plan will not only reskin the muted tower in a crystalline shell of multi-directional glass panels, but it will incorporate gardens into its façade and interior, highlighted by a mammoth sky garden on top. It will also modernize its interior and improve the surrounding plazas and landscapes, knitting the aloof tower back into the city fabric. Meanwhile last winter French President Emmanuel Macron (then still a candidate for President), shared Defacto La Defense's (the group that manages the area) plans to build seven new skyscrapers in the La Defense district by famed architects incuding Jean Nouvel, Arquitectonica, Foster + Partners, Christian de Portzamparc and others by 2022. The goal—touted by a marketing campaign called “Tired of the Fog, Try the Frogs!”— was to reposition the area as a business alternative to London, where Brexit has cast a confusing pall over international corporations. The towers, if built, would be called Trinity, Alto, M2, Hekla, Sisters, Air 2 and Hermitage Plaza. Marie-Célie Guillaume, chief executive of Defacto La Defense, last winter told FT that they wanted to send a “powerful message to businesses that are uncertain about their future.” It remains to be seen whether all of these projects will indeed move ahead, although, for one, Foster's web site still lists Hermitage as a go. Finally, Herzog & De Meuron’s Tour Triangle, a 591-foot-tall tower that will be the first within the city limits since Montparnasse (that law banning tall buildings in Paris was overturned a few years ago), continues to move ahead since its approval back in 2015. Located on the site of the Parc des Expositions in the 15th Arrondissement, the crystalline building’s pyramidal form is meant, say the architects, to open up a massive internal atrium, reduce shadows on adjacent buildings, and to create an increased setback from the nearby peripheral boulevard. 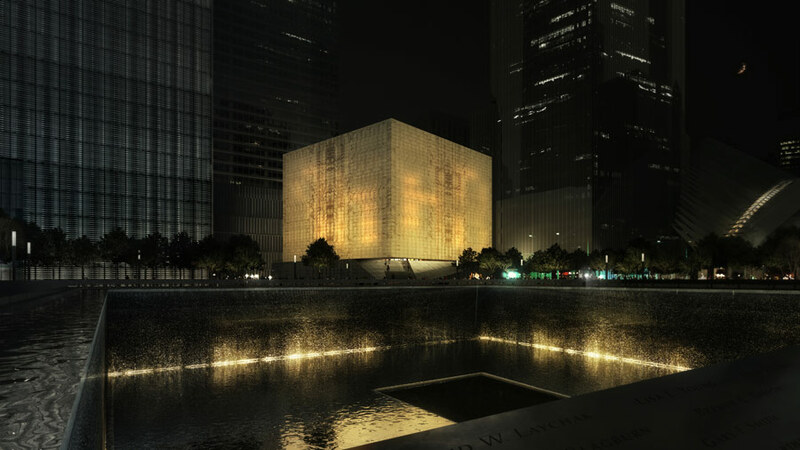 Herzog & De Meuron’s web site lists completion at 2020. Most agree that the Tour Montparnasse is in need of a facelift. As for the remaining towers, Parisians are unsurprisingly split. Many have hailed the influx of offices, residential space and modernity into what is a frustratingly-frozen city. But opponents fear the beloved character that makes Paris Paris is destined to be lost. "Unless someone stops them now, international starchitects and their developer and corporate patrons will succeed in vandalizing the horizon of Paris," exclaimed preservation group SOS Paris after the announcement of the Tour Triangle. On verra. 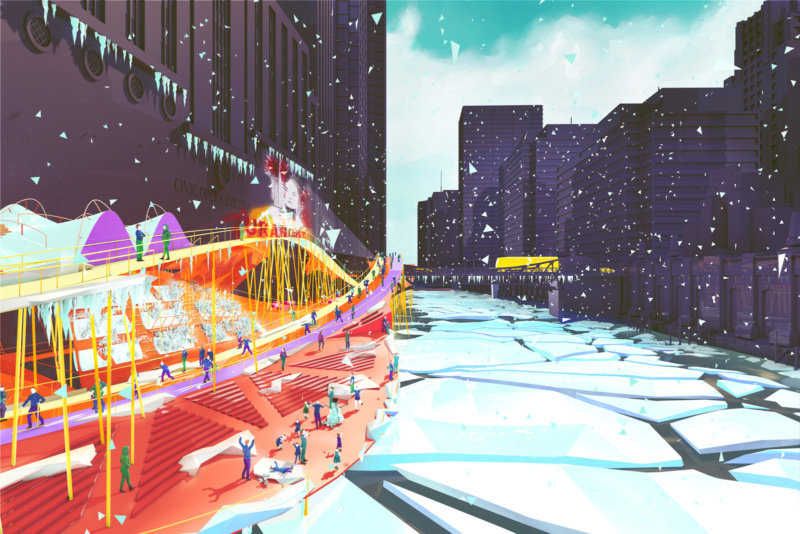 What is the future of the Chicago riverfront? The Chicago Architecture Biennale kicked off on September 16, and there are lots of costumes. Ana Prvacki and SO-IL collaborated on "L'air pour l'air," a sculptural performance in which wind musicians wore air-filtering enclosures meant to "clean the air that produces the music" like the plants in the surrounding conservatory. Meanwhile, at Exhibit Columbus, IKD's Conversation Plinth plays a central role with its concentric wooden platforms hosting performances, programs, and public dialogue on the plaza outside an I.M. Pei-designed library. Before heading to Chicago for preliminary festivities, renowned architectural photographer Iwan Baan paid a visit to Yale's Skidmore, Owings & Merrill-designed Beinecke Library (1963), which is covered entirely in panels of translucent marble restored last September. Okay, okay. At this point we've done too many bouncy castle posts. Instead, here's another Never Built New York gem over at the Queens Museum, via our friends at Archtober: Samuel Friede's 1906 proposal for a globular zoo at Coney Island. It contains elephants, a restaurant, and a 50,000 room hotel (#practicalspending). Joseph Grima, former director of Storefront for Art and Architecture and founder of Space Caviar, geared up for IdeasCity New York in Sara D. Roosevelt Park – a New Museum initiative that has previously hosted events in Detroit, Athens, and Arles. Musician David Byrne of Talking Heads fame will give the closing keynote. Landscape architecture dream team SCAPE has been selected as to participate in Resilient By Design's Bay Area Challenge. Their team, Public Sediment, partners with Arcadis, the Dredge Research Collaborative, TS Studio, the UC Davis Department of Human Ecology and Design, the UC Davis Center for Watershed Sciences, and the Buoyant Ecologies Lab. One last Chicago Architecture Biennial post and we're done (for now). 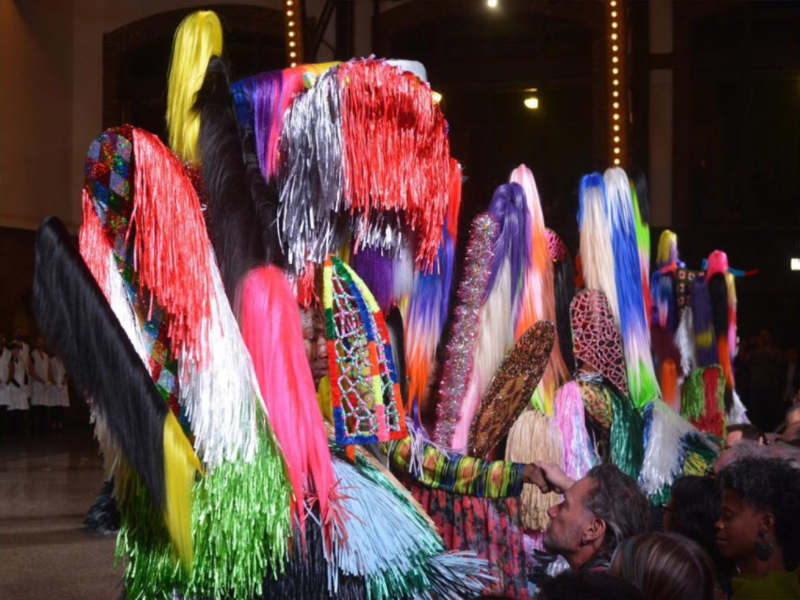 Best for last: the long-awaited collaboration between artist Nick Cave and architect Jeanne Gang turned out to be as colorful and wild as expected, entitled Here Hear Chicago. Performers wearing Cave's well-known "soundsuits" meandered through a Studio Gang-designed set of buoys, scored by composer Kahil El’Zabar. For a video sample, head over to our Instagram. For the concurrent opening of EXPO Chicago and the Chicago Architecture Biennial, artist Nick Cave and architect Jeanne Gang put on a show few are likely to forget. The first performance of their collaboration, Here Hear Chicago. took place on September 13 at Navy Pier’s AON Grand Ball Room for a capacity crowd during EXPO’s Vernissage. Subsequent shows will take place over the weekend for the public. The buzzing atmosphere of EXPO’s preview night was overtaken by the sound of drums a half hour before the scheduled start of the performance, as a parade of Cave's uncanny “Soundsuit”-clad performers marched between the stalls of the international art show. Guests ran to get a look and cheered the scene as the performers made their way to the grand ballroom. Before entering the space, the troop moved through a forest of six-foot tall “buoys,” made by Studio Gang. Each performer wove and danced around the more than 200 teetering chrome Mylar objects as the crowd followed. Nick Cave-Jeanne Gang: Here Hear Chicago (Courtesy Spirit of Space) from Architect's Newspaper on Vimeo. The show itself began in a more muted key. Set to the haunting music of composer Kahil El'Zabar, Cave and a group of young men took the stage. Sitting perfectly still for a full half hour, each was attended to by a white-clad attendant who slowly and methodically dressed them in colorful fur soundsuits. When they finally stood, bodies completely abstracted, the crowd roared their approval. For the next 45 minutes, the performers moved through the space, interacting with each other and the crowd. Most of the time their bodies were abstracted and concealed. A fleeting glimpse of a foot or hand shooting out from the exorbitant costuming was the only hint of humanity in the alien forms. Guttural calls and howls by the performances accompanied El'Zabar’s abstract jazz, with the occasional call back from members of the audience. In the last moments of the show, Nick Cave set the long line of buoys lining the stage into movement. For those who may have hoped that the Studio Gang-designed elements would have played a larger role in the performance, this was the apex. 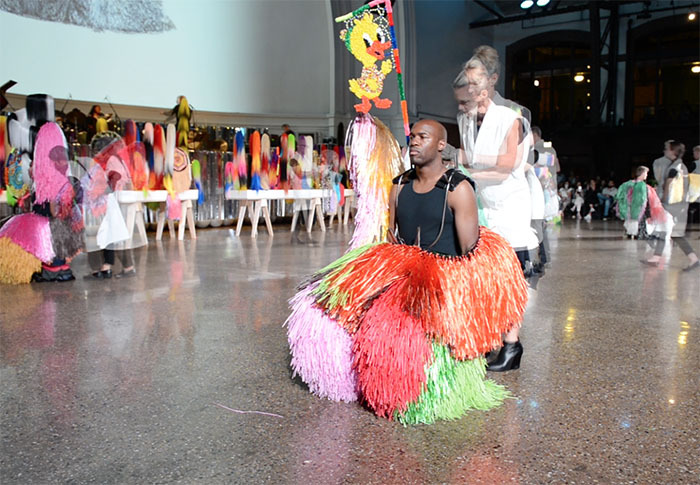 Once the show was complete, many guests rushed to engage with the playful forms. Here Hear Chicago was part of the kick-off of the sixth EXPO CHICAGO international art exhibition and the second Chicago Architecture Biennial. EXPO runs from September 13 through September 17 at Navy Pier, and the Chicago Architecture Biennial runs from September 16 through January 7, 2018 at various venues, with a main exhibition at the Chicago Cultural Center.